Woke up did our morning routine, had an English muffin in a dippy egg for breakfast. Watched a little of The Today Show. My eyes are still itchy, and I have quite the runny nose, and sneeze like crazy every day. We had to go to Walmart to get my pills. We left before lunch. We found a few more things I wanted at Walmart, Jim was trying to get a fishing license there. But their Verizon was down which shuts down everything. Some lady was telling us in Walmart about this other store I wanted to go to. Their meat was supposedly so much better than Walmart. I really wanted to get some steaks from Texas. Walmart said they were from South Dakota I think. I stopped and got my pills and I actually got a three months supply of each which will be nice. Jim was getting hungry so we made a quick stop for the first time in a Whataburger. He had a patty melt minus the hot sauce, he said he really liked it he also liked the grilled onions and the grilled Texas toast. I did not get anything, had a couple of his french fries, not that good was easy to stop. Then we headed over to the other store that I was never in, that the lady recommended in WM called Brookshire's. Jim said he could wait in the truck, which I said was fine. I went in mainly just to buy meat. She said they always have a good sale on a couple different meats every week. 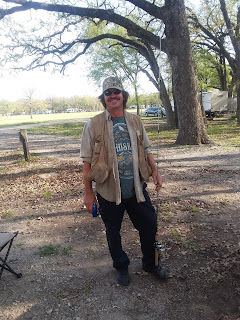 I bought him a couple of steaks that were from right here in the town we were camping in, which is Quinlan Texas. I got some chicken tenders, mainly because they were small packs I could squeeze in the freezer. I also found some pork chops, and some beef cubes. Course I bought a few other things that I couldn't find at Walmart, then when I went to check out they said you can only use cash or checks, because apparently the same problem Walmart had, was Verizon's down everything shut down. I said well if you'll take a Pennsylvania check. That was pretty much a no-go so I texted Jim when he brought in cash, it was like $47 worth of meat. Quite the expensive month for food shopping. Then we headed back to the FW put everything away. When we got home, our neighbor was here that has a permanent site, and that we never met before. They wanted to see if we had electric, because they did not. Their fridge was on electric so they had to throw everything out , Jim chatted with him for a while. TT told them they couldn't do anything till tomorrow morning , if not they would just go back to Dallas he said. 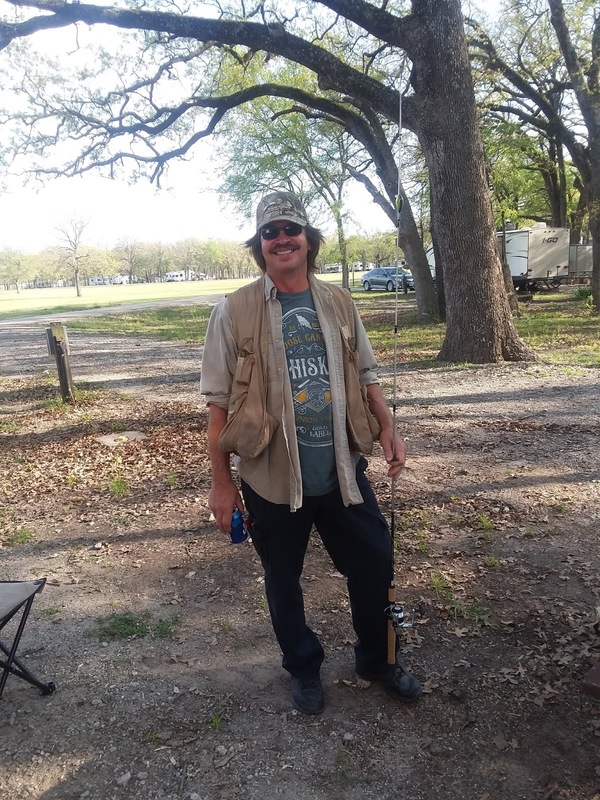 Jim was never able to get a fishing license, so he did it online with his phone. I put the pizza I saved for today in the oven made a salad for dinner, although an early one. Jim went fishing for about two hours. He came back and started a campfire. We both sat out for awhile very nice evening. When we both came in we watched a little TV and went to bed at the same time didn't do that for a while.